Gorgeous art! A new twist on the classic story. The Piper has a love interest, but things don't go well...atmospheric and sad...I was fully immersed in this story. #1 international bestselling author of Thirteen Reasons Why Jay Asher and co-author Jessica Freeburg brilliantly reimagine the classic Pied Piper legend as a powerful graphic novel about loneliness, love, and vengeance. Fans of Neil Gaiman and Through the Woods by Emily Carroll will devour this eerie, atmospheric retelling. 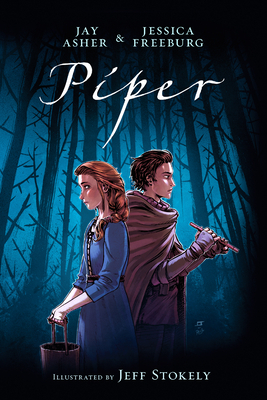 With striking illustrations from Eisner-nominated artist Jeff Stokely, mixed with Jessica Freeburg's work on historic and legendary horrors, Piper is an exciting new departure for Jay Asher that deftly touches on the same themes of truth, guilt, and redemption that made Thirteen Reasons Why a beloved bestseller. JESSICA FREEBURG is the author of paranormal fiction (Living in Shadows) and narrative nonfiction works focused on creepy legends and dark moments in history including Monsters of the Midwest, Fight for Survival, and Collapse and Chaos. To blend her love of writing with her passion for history and the paranormal, Jessica founded Ghost Stories Ink, a group of authors, illustrators, and filmmakers who visit historic locations and perform paranormal investigations for creative inspiration. She also serves as the assistant regional advisor for the Minnesota Society of Children's Book Writers and Illustrators. Follow her @JessicaFreeburg. JEFF STOKELY is the co-creator and artist of Eisner-nominated comic series THE SPIRE. He is the artist of acclaimed series SIX-GUN GORILLA and JIM HENSON'S THE STORYTELLER: WITCHES, THE REASON FOR DRAGONS. Follow him @JeffStokely. Gorgeously illustrated and lyrically paced, PIPER had me under its spell from the first page. A riveting and, at times, chilling response to one of the most fascinating legends that history and fairy tales have given us. Jay Asher and Jessica Freeburg have conjured real magic with PIPER! Mysterious and weird, scary and yet charming, they’ve managed to take an old story and craft it into something beautiful and new! Highly recommended. With an unfailingly honest touch, Piper unlocks the mystery and finds the heart of one of our most haunting legends. Asher, Freeburg, and Stokely find the emotional True North and leave their audience, including me, reaching for our Kleenex. Loved!